Earlier this morning I read that Robert Mueller’s team has added over a dozen new attorneys to help dig deeper into the malfeasance and corruption at the heart of Trump’s circle. Now, the president’s personal lawyer, following the wise move of Vice President Pence, has hired another lawyer to represent him. When lawyers hire lawyers they know it is about to get real. Trump is single-handedly attempting to kick-start the economy by providing more jobs for lawyers. 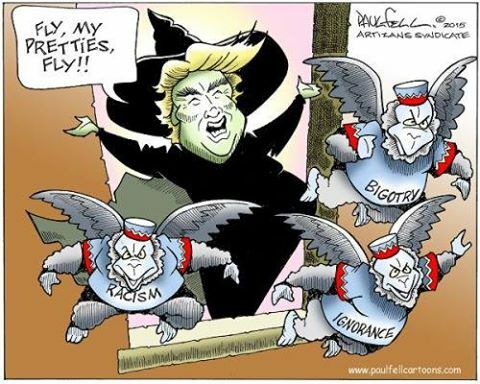 I don’t care how many flying monkeys the #Blotus lets fly, the Hounds of Justice are coming after him, and he can feel them getting ever closer. This entry was posted in News & Views, Quotes and tagged artizans syndicate, attorneys, bigotry, BLOTUS, corruption, economy, flying monkeys, greed, hate, hounds of justice, ignorance, lawyers, lies, malfeasance, Paul Fell, Pence, racism, Robert Mueller, Trump on June 17, 2017 by Ray Buchanan.